“I decided to leave the security of a corporate position and purchase a new business. As a first time business owner, I was referred to Attaway Linville by my business broker to assist me with the due diligence on a potential acquisition. I began working with Randy Linville and found him to be very capable and able to effectively communicate fairly complex issues in a manner that was easy for me to understand. The value he added was instrumental in my decision to move ahead with the purchase of the new business. After the acquisition, I decided to continue working with Attaway Linville during the transition period. While I have advanced degrees and a decent financial background, I knew my focus needed to be on building my business. So, I relied very heavily in the early months on Randy’s ability to handle the financial side of my new business. The books were a mess and because of my newly acquired business started off to a slow start, I did not have the cash available to service my debt obligations. Randy and his staff were instrumental in cleaning up our books, training my staff on how to properly perform the bookkeeping, negotiating with lenders and putting together contingency plans. “I first met Attaway Linville on a referral from a bank issuing us a credit line. We were so impressed with their work on behalf of the bank, that we began working with them directly. Attaway Linville did more for me than “crunch the numbers”. They look at everything my business does. “After working in corporate America for 26 years, I left to pursue a dream of working for myself and getting out of the grind. I was referred to Attaway Linville by my attorney. My business is in a highly competitive market, and I don’t have the time or willingness to make many mistakes. I want to get it right the first time. It is very comforting to have someone who knows the C-corp world and its particular requirements, challenges, and opportunities. Because I was utilizing my 401-k to fund my fledgling business, I needed an accounting firm with very specific knowledge within both corporate and personal tax law. Laurie and Randy were willing to take my calls and chat through issues, not just give me a pat answer. During a visit to my office, we talked together about my goals, what I wanted to accomplish, and the money I had. They worked up a plan that fit what they could offer with my budget. In addition to payroll and taxes, their staff assists me with ongoing bookkeeping, and serves as financial consultant as needed. I feel that they are constantly thinking of what’s best for me and my business. 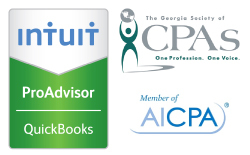 I trust them to be the expert on the accounting and bookkeeping, and I have not been let down. In fact, I’ve been delighted to work with them. I can’t tell that we are in a different state because they always take my call or respond quickly. Most of modern bookkeeping is so electronic that there is no need for me to see them in person, especially with the technology platform they offer. Everything I add they can see in real time, which gives me peace of mind.